You may be tempted to start aquaponics but want to start on a low budget. In this video we will see how to collect the necessary equipment to build your first flood and drain aquaponics system with a very limited cost. 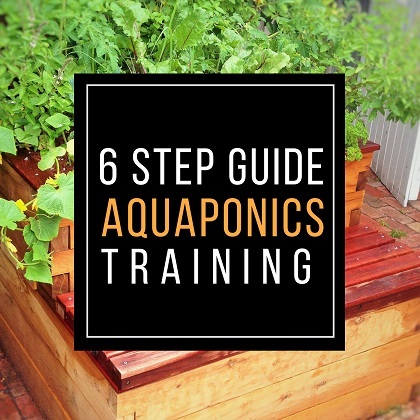 As explained in our previous video “how to start your aquaponics system” and in our free aquaponics training available at the end of this article, you will need to collect 4 main parts. The first 2 parts are the fish tank and the growbed. Those 2 must respect specific ratios (see free aquaponics training). I also recommend to get large tanks over small ones as small aquaponics setups are tricky to manage (I don’t recommend starting below 300Litres of total capacity). One of the most commune options is to get an IBC (Industrial Bulk Container) and cut it in order to form a fish tank and a grow bed. Following this method you can have access to those 2 tanks (fish tank and grow-bed for 0 to $50. The grow-bed must be equipped of a flood and drain system in order to allow the plant roots and bacteria to breathe the oxygen from the atmosphere. This bell siphon can be bought and you just have to easily fix it. Alternatively you can make your own bell siphon from a few PVC pipes. This second option is very cheap but be aware that bell siphons can be tricky to design and will probably cost you time before you find the adapted design to your specific water flow. The water pump is probably the only pipe that you can’t build by yourself. It is possible to recycle old equipment from washing machine or other but generally a water pump is not so expensive as long as you don’t oversize it. In the free aquaponics training I offer a specific technique to calculate the exact water pump necessary for your setup. Going for a huge water pump will not necessary improve your system productivity but will be costly and consume an unnecessary quantity of electricity. If you get the exact adapted water pump to your system, the budget will be extremely low. You can build your aquaponics system with a very low budget. It will probably not be the nicest looking setup but it will allow you to get familiar with the concept and produce some food. Let review the equipment needed to build a budget aquaponics system. So I recently published a video to show you how to start aquaponics but today, I want to show you how to build a setup from very cheap materials, so how to find cheap equipment and being able even if you don’t have a big budget to start aquaponics. My name is Jonathan and my aim is to help you to grow sustainable and healthy food in your own backyard, thanks to aquaponics. I offer you free information and free videos, and in the description of this video just below, you can get access to a free training to build your own aquaponics system. It’s completely free. It’s a step-by-step process. You follow the process and then you are able to grow some fantastic food in your own backyard. So once you get access to the free training, you will arrive on this page, and here you will have a detail of different steps and each time you got a video or some description to really allow you to build some strong knowledge and to know and to learn the basics of aquaponics to avoid any mistakes. So just enter you email address and you will receive access to this training. So let’s talk about the equipment and the materials needed to build an aquaponics system. So you know that there are different types of aquaponics, right? We got a grow-bed aquaponics such as I have behind me. Then we got the NFT system so nutrient film technique where you are growing food in pipes, and finally, we got the raft system or deep-water culture where you are growing plants on rafts, on a tank. So the easiest aquaponics system to start I believe it is the grow-bed aquaponics such as I have behind me. And then you got different equipment that you can add in your system. You can add some sump tank. You can add different filters, but let’s start with a very, very simple system where you got just a grow-bed and a fish tank. And that’s the easiest one to really design. We made a video about it a few weeks ago so you can have a look at the video, how to start aquaponics but now what I want to show you is what type of materials we need. So if we follow the grow-bed system, so we call it flood and drain aquaponics system. Flood and drain simply because in the grow-bed, we’re going to have a variation of water level. So if you look behind me, we got some grow-beds. On the bottom, you got some fish tank. In the grow-bed, you got the water level that is going to go up and down. This grow-bed is full of media so there are some rocks. The plants are growing on the rocks but on the rocks you got some bacteria and we want the water level to go up and down. So in terms of equipment, we’re going to need four different things for this setup. First thing, we’re going to need two tanks. So there’s one tank for the fish. That’s what we call the fish tank and a second tank for the plants and the bacteria. We call it the grow-bed. So the grow-bed is gong to sit on top of the fish tank. So again, if you don’t know how it works, just get the free training from the description of this video. I explain everything and I give you the correct ratio for those different tanks. Then we need a bell siphon so that’s a system that is going to allow us to flush the water back from the grow-bed to the fish tank so it’s going to allow us to make this flood and drain, basically water variation, water level variation. And finally, we need a little water pump. So those are the four main parts of an aquaponics system. Then you can an air pump so depending on the population of fish you have, depending on the density of fish and the quantity of them and the species of them, you’re going to maybe have to add a bit of oxygen in your system. So basically, add an air pump to increase the oxygen concentration in the fish tank. But today what I want to talk about is a very simple aquaponics with a very low concentration of fish, fish that are adapted to beginners, so very hardy. So generally, we don’t even need the air pump. It’s always a plus if you can put an air pump but if you start with a few fish, the simple flush of the water is going to be enough. So the four main things are really those four that we just talked about, the two tanks, the bell siphon, and finally, the water pump. And obviously, you need some pipes to connect the water pump to the grow-bed. So right now, what type of equipment material can you use for the two tanks, the fish tank and the grow-bed? So here you got a very wide choice of tanks. You can buy tanks from a specialized shop. You can buy aquaponics tanks but you can just buy fish tanks. Most of the time they are made of fiber but they can be a bit pricey. But if you are on a budget and that’s what we are talking about today, it’s really a video to help you to start if you don’t have much money to put on this project but you still want to try aquaponics, there are some options to basically find those four equipment, four materials for a very low price. So first, what you’re going to try to do is to recycle equipment. So a fish tank is basically just waterproof volume. So what you need you can work with IBCs. A lot of people are working with IBCs and they are very cheap and they are very efficient. They have very big volume and it works really well for aquaponics if you just want to start. So I really, really recommend to use IBCs but if you use an IBC, so industrial bulk container, if you use those types of things, you want to make sure that what was inside before was not a chemical. You want to make sure that it was food grade. So you know, IBCs can be used for a lot of things. They can be used to store chemicals but they can also used to store food, you know, food, liquid or colorant or whatever, but things that are food grade. So when you buy your tank, or when you get your tank, reuse your tank, finding from anywhere, just want to make sure before anything that was inside was basically food grade or it was never in contact with any harmful chemicals. So here we are talking about IBCs but it can be any bucket and a large bucket. It can be a bin, you know, an old bin. It can be a tub. I mean, the choice is very wide and when you start aquaponics if you just want to try the concept if you want to try if you are interested, just don’t spend too much money. You can recycle things very easily. Obviously, it’s probably not going to look the best but if you are just trying the concept, if you are just starting, if you just want to produce a bit of food in your backyard, that’s completely fine. Just make sure again, it’s completely food grade. And then from there, you have your grow-bed and your fish tank. So for the dimensions of those two, there is a ratio to respect. I direct you to the free training because again, you go in the description of this video. You got all this information for free so I’m not going to repeat in each video. It’s a lot of data. So just get the free training and you’re going to have all the information you need. But connect those two tanks. So again, I think you can get them for free or for very cheap price. Then you need the bell siphon. So I made a video about bell siphon. The bell siphon, you can make them by yourself. They are a bit tricky to find the good dimensions but again, follow the video I made and you’re going to find a lot of other videos on line to know how to build your own bell siphon. But otherwise, you can just buy one that is already made and at least you know that it works and it’s not going to take you too much time to build it and to find the good dimensions. So basically, a bell siphon is just a few pipes one in each other so it’s quite simple. I mean, not simple to design because obviously, you need to have good dimensions but what I mean is like there is no very costly equipment in it. It’s just some pipes. So again, you can find these parts at a very low price. You can just buy it already made or you can make your own for a very, very low budget. So those three equipment here is really, really to teach, really easy to get and they are very affordable. The last one is a water pump and water pumps you know, you got all prices but again, if you follow my training, the free training is in the description. You’re going to find what exact water pump you need for your exact aquaponics system. Depending on the volume of the fish tanks and the volume of the grow-bed, we’re going to be able to determine the quantity or the capacity of the water pump that we need. And from there we’re going to be able to just find the pump at a low price and not buying a big pump that is very, very costly to purchase but also very costly to run because you know that a big pump is going to consume a lot of power, a lot of electricity. And then obviously, it’s going to add to the cost of the setup. An aquaponics setup if it’s well-designed, it consumes a very, very low quantity of power, of electricity. But if you put a very, very big water pump, then it’s going to consume a lot and most of the time it’s completely useless. So just get a proper water pump that is really adapted to the size of your setup. And if you start with a setup that is 1,000 liters, which is what I recommend, if you have a 1,000-liter setup, then the price of the water pump is going to be, if you are in Australia or the US, Europe, it’s probably going to cost you around between $30 to $60. It’s very, very affordable. If you want a really good quality pump, it can go up to $100-$150. But you can start on a very low budget. If it’s just a small project, just start with a cheap pump for less than $50. And you got a setup running for less $50 because basically, that’s all you need. Then you need a pipe to connect the water pump to the grow-bed so you need just 2 meters of pipe so it’s very, very cheap. Even if you buy it it’s not going to cost you much. And that’s all you need, basically. Then the gravel to put the media. You know, you can basically find it for very, very affordable price. Then the water obviously, you need some water in your system. And then the fish. Again, the fish, you can go fishing and get the fish by yourself or you can buy them when they are small and they are very, very cheap. So that’s how you can have a very affordable aquaponics system. Now, I just want to have a comment in this video that is for me very important that if you want to try the concept of aquaponics, if you are new and you say, “Oh, okay. I would like to see if it works” or whatever. Yes, it works but you have to start with a certain volume. I see too many people who sell very, very small setup, you know, that you can put in your kitchen. They are like 50 liters or whatever. I would really, really highly recommend to stay away from those types of setups because they are super hard, super challenging to manage. And most of the time, people buy them. They try it for a month or two months. After a while, they can’t manage the water properly because the variations are way, way, way too high and therefore, the fish die and they put the setup away. So basically, it’s a lot of pollution. You kill the fish and you don’t produce anything. So it’s a waste of money. So please stay away from those types of pre-made setups that look good you know. It looks like quite funny but really honestly, it’s very, very hard to manage. Try to make your own or buy one already made. But if you are on a budget, if you are on a very limited budget, I would really highly recommend to follow the advice I give you in this video right now to get those four elements for a very low, low cost. So I think you can get it for less than $50 altogether, depending on where you live. Then you start on a setup that is at least 500 liters. I mean, 300-500 liters but don’t go below because then you have some troubles to balance the quality of the water basically, you know, the ammonia, nitrites, nitrates, the things that I talked about in my other video, in the video of how to start aquaponics. It’s very, very simple things, right, but on a small setup, you can’t manage it properly. It’s too difficult. On a big setup, you don’t have to do anything. Once you go over 500 liters you know, it’s all done by itself, almost. You have to check but you don’t have to act on it, while on a small, small setup of 50 liters, it’s going to be very, very tricky. Again, if you haven’t done it yet, please get the free training. It’s a lot of free information that I give you here to start aquaponics on a good basis. It’s going to help you to build a really good aquaponics system and to build some good knowledge to produce some sustainable, healthy, and tasty food in your own backyard. So get the free training and I hope you enjoyed this video. If it’s the case, please give it a like. Subscribe to the channel if you haven’t done it yet, and see you in the next video. Bye-bye. So if you are new to this channel, please subscribe. I’m going to release one video every week. Don’t forget to get your free gift from this screen. You can also leave me a comment below the video. Subscribe to the channel and see my last video. I really hope to see you soon, and I wish you a fantastic success with aquaponics. Have a good crop!